Australia is the world’s number two gold producer; the country's tightening its grip on the trade in iron ore and coking coal; comes in at no 6 for copper; and is set to increase output of mineral-du-jour lithium from the current 38% to nearly half the global total within five years. That’s the result not only of a rich mineral endowment but massive amounts of money spent on exploration across the continent. 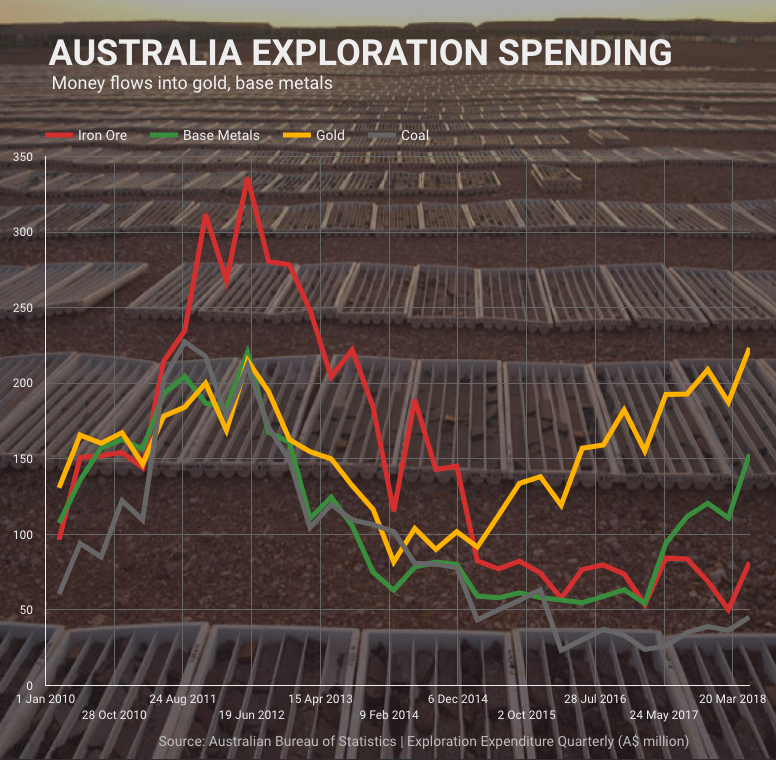 After a sharp drop-off when it became clear that boom times for Chinese economic growth were beginning to taper, new data from the Australian Bureau of Statistics shows the country’s miners and explorers are once again pouring money into the sector. ABS announced this week the country’s mineral exploration expenditure jumped by 26.6% during the second quarter compared to last year to total $563.4m. That’s the highest level since the third quarter of 2013. Spending on base metals rose at the fastest pace, up 38%, to the highest since the final quarter of 2012. Iron ore exploration also appears to be escaping the doldrums after two quarters of sequential growth (although nothing close to spending from 2011 to 2014 when iron ore was worth double it is now). Most striking is the amount of money chasing gold. Spending on gold exploration at $223m was the highest since the second quarter of 1997. The June quarter also exceeded spending in the second half of 2011 when gold prices reached all-time highs above $1,900 an ounce. 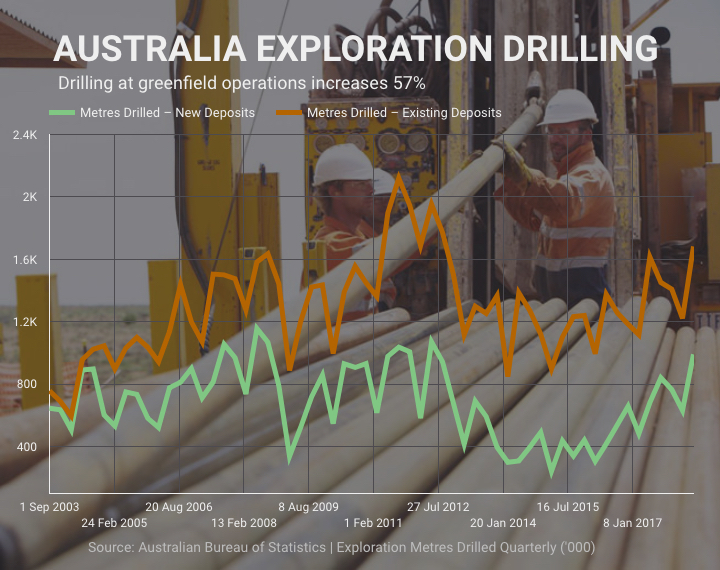 Although smaller in absolute terms, greenfield capex is back in focus with investment in exploration on new deposits rising 37% to $54m during the June quarter compared to 24% more spent on expanding existing resources ($70.7m). A total of 2.57 million metres were drilled during the quarter, up a whopping 44.3% year on year. Here the focus on new discoveries was even more evident with drills at new deposits working much harder – up 57% to just shy of 1m metres – versus at existing deposits which rose by 38%. The total number of metres of drilling on new deposits was the highest in six years and more than triple the total for the first quarter of 2016, when metals and mineral markets started to bottom. Holes drilled at greenfield projects as a proportion of overall metres was the highest since 2010, ABS data show. Encouraging for the Australian industry is that spending is much better spread across sectors compared to the height of the China-induced supercycle in commodity demand. During the go-go years spending topped $1 billion during two quarters – the final quarter of 2011 and the second quarter of 2012. 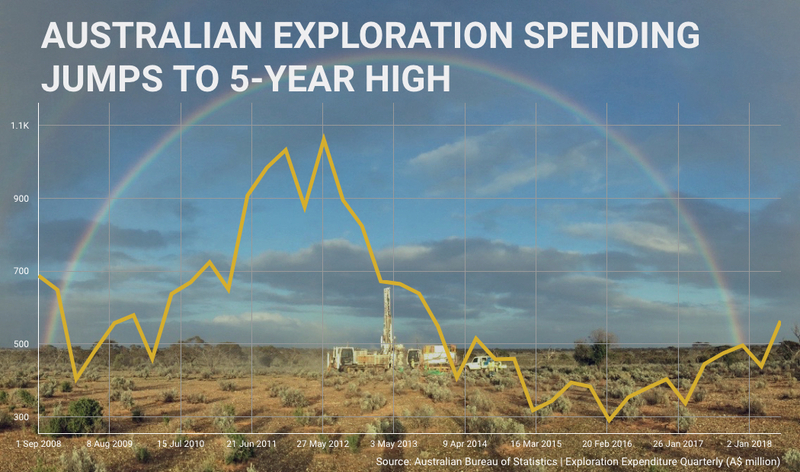 But during that period coal and iron made up 51% of total exploration spending. The most recent figures show the share of Australia’s top export earners falling to 22% of the total.